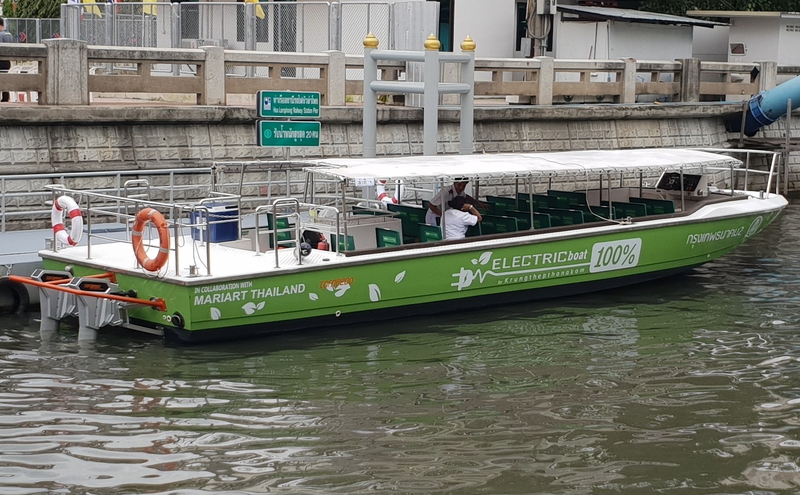 The Bangkok Metropolitan Authority (BMA) has launched Thailand’s first all-electric commuter ferry. The 47.5-ft fiberglass vessel was repowered by MariArt Shipyard, replacing the existing 205hp diesel engine with twin Torqeedo Cruise 10 kW electric outboards, each with six Torqeedo lithium battery banks and two fast chargers. The 40-passenger vessel is part of a fleet of ferries operated by BMA’s Enterprise Krungthep Thanakom Company (KT BMA) and operates on a five-kilometer route daily between Hua Lampjong and Thewes Pier. See also: Ocean Marina Pattaya Boat Show to Take Place 29 November - 2 December 2018 and Hotel Waste, Single-Use Plastic and Climate Change - Interview with WWF. See latest HD Video Interviews, Podcasts and other news regarding: Bangkok, Thailand, Ferry.